Ever try a Negroni? There couldn’t be a better time to try one – it’s international Negroni Week. Here’s a little taste of how the classic drink came to be. We highly recommend reading this while enjoying one at our bar. The history of the Negroni is just as complex as its distinct flavor, with many documented versions of how the classic drink came to be. The most widely documented story brings us back to 1919 and to a little bar on Tornabuoini Street in Florence now called Caffé Giacosa. It was here that Count Camillo Negroni asked the bartender to add more kick to his Americano, which was a cocktail with equal parts Campari and Amaro and some soda water. The bartender responded with gin, using it instead of the soda. It became the Count’s usual drink and soon enough other bar patrons started asking for the Negroni. However this version has been disputed by some historians, with new evidence suggesting the Negroni was invented in Africa by General Pascal Oliver Comte de Negroni , a Frenchman who fought in the Franco-Prussian War of 1870 and introduced his fellow officers to a version of the drink with vermouth. For more on the drink’s history visit the diffordguide.com. Regardless of its beginning, the Negroni has become a staple drink on bar menus across the world, including at Verdicchio. From June 5 to 11 we celebrate Negroni Week with a focus on the original legendary concoction, and Negroni variations created by our resident barkeeper Justin Trottier. “The Negroni is a pretty simple recipe to replicate,” explained Justin. For Negroni Week we have added a few more variations to our bar offering. 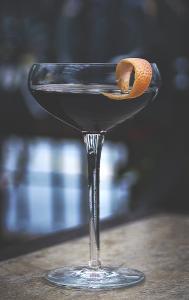 Try a Darkest Darkness, which is made with aged rum, amontillado sherry, amaro erbes and expressed orange. “It was easy to mix and match different items and come up with some really fun combinations,” said Justin. The inspiration for the drinks featured on the Negroni Series menu is quite simple. Take a peak at Justin’s Negroni cocktail menu here.